To make the dressing, combine all of the dressing ingredients in a small bowl and whisk vigorously to combine. 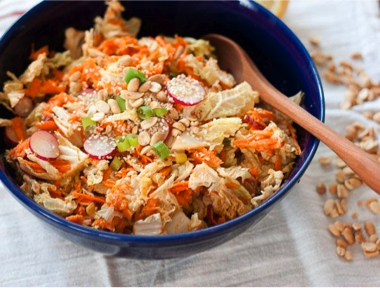 In a large salad bowl, combine cabbage, carrot, green onions and radishes. Toss with dressing. Top with sesame seeds and peanuts. Serve immediately or chill before serving. This salad is best the day it’s prepared although it’s just fine the next day if covered and refrigerated. Note: You can add tofu or even soba noodles to make it more of a substantial entree. I suggest doubling the amount of dressing to ensure it coats every extra addition evenly. If you can’t find Napa cabbage at your grocery store, feel free to use any cabbage. Also, toss in any little crunchy vegetables you may have laying around in the crisper: celery, bell pepper, or cucumber would be great here.